We recommend that you use a naming convention for your drawings. Especially if you combine all the angles of a character in the same breakdown scene, it is a good idea to identify each angle used. Before breaking down the characters for your production, we recommend that you create a drawing name convention that represents the angle used. 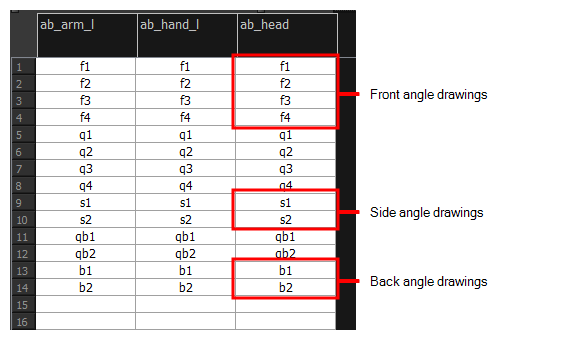 For example, use "f" for front, "s" for side, "q" for three-quarter so that the drawing name looks like this: f1, f2, f3, s1, s2, etc. This will be quite useful during animation and drawing substitution. Since drawings are displayed in alphabetical and numerical order, all the drawings for the front view will be together, then all the drawings for the three quarter view, and so on. Keep in mind that in the drawing substitution library, drawings will show in alphabetical order. If you want them positioned in a certain order, make sure you name them accordingly. In the Timeline view, select the drawing range to rename. ‣ Right-click on the selection and select Drawings > Rename Drawing with Prefix. 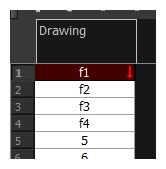 ‣ From the top menu, select Drawing > Rename Drawing with Prefix. 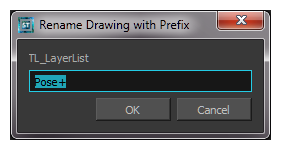 The Rename Drawing with Prefix dialog box opens. Type the characters you want to add before the current drawing name. NOTETo rename a drawing, select the drawing and use the Rename Drawing option. Ctrl + D (Windows/Linux) or ⌘ + D (Mac OS X). or . Do not double-click on the frame and write a new name, as this will create a new drawing and hide your actual one. Note that the hidden drawing has not been deleted and is still located within the element folder. Simply retype the name and it will reappear.